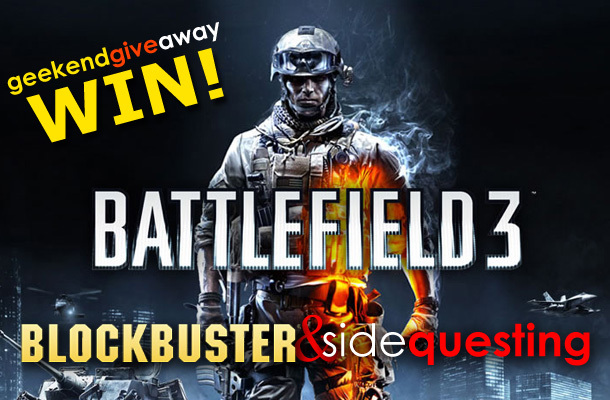 Win Battlefield 3 from Blockbuster and SideQuesting! Like us, our friends at Blockbuster know that you love games. They know that you love incredible deals, too. In fact the latest sweet Blockbuster promotion, running through Nov. 22, gives you a FREE month of unlimited game and movie rentals if you buy a copy of Battlefield 3 in store. For those that haven’t picked up the game yet, this is a great chance to score some rentals for the month. (And, with all those vacation days you have saved up, this is the perfect compliment). They also know that you love prizes and contests. All of those awesome things coming together equal something perhaps on the “spectacular” level. That’s why they’ve teamed with us to offer you an EPIC prize. By entering this week’s Geekend Giveaway you’ll have the opportunity to win one of two copies of the game, for either the Xbox360 of the PS3! That’s right, TWO people will win! And how do you win? Leave a comment, of course! In your comment, tell us what was the longest time you had ever had a game or movie overdue for, as well as what platform (PS3 or 360) you’d like the game if you won. That’s it! And you have 3 chances to win, too! Starting today (Friday) and running through Sunday Nov 6th at 4PM EDT Eastern (1PM PDT Pacific) leave your comment below. Open to US residents only. That’s all! Good luck, and get to commenting! Special thanks to Blockbuster for providing the games! Please check out their promotion, which lasts through Nov 22nd, by clicking here! Contest starts Today, Friday November 4th, and ends on Sunday, November 6th at 4PM EDT (Eastern time)/ 1PM PDT (Pacific). Leave a comment on this post up to once per day, Friday to Sunday, for a total of 3 chances to win. Two winners will be selected — One for Xbox 360, one for PS3. Winner receives the standard edition of Battlefield 3 for their console. Please see our official Contest Rules for more information.